Where is Pamukkale in Turkey? Hierapolis Ancient City is located at 24 km to Denizli and was founded by the Bergama King Eumenes II on 190 B.C. The city was named after “Hiera” who was the beautiful wife of the legendry hero Telefos and it also means “holy city”. 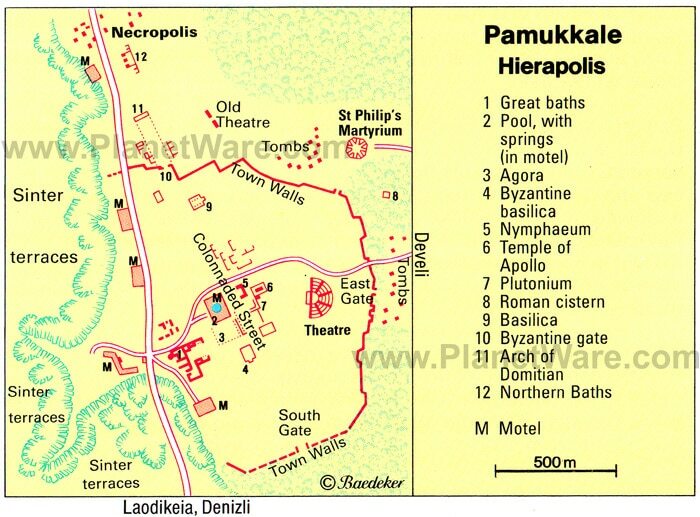 The ancient city of Hierapolis, the original site of Pamukkale, was known as the Holy City in archaeological literature because of the abundance of temples and other religious structures in the area. The city has traces of the Hellenistic period and was sized by Romans together with Bergama on 133 B.C. It was completely ruined down with a strong earthquake on 17 B.C. at the time of the Roman Empire Tiberius. Then the city was re-built and given a total Roman character. The city lived its golden age under the reign of the Roman Empire Septemius Severus during the 2nd and 3rd centuries A.D. and became a summer time living area for the elites of the Roman Empire. The Hierapolis pools, necropolis, streets, agora, city doors, gymnasium, antars, Ionian columns, bridges, and churches are worth to see and its theatre with a capacity of 9.000 has a charming atmosphere. Hierapolis was popular for its thermal springs during Hellenistic times, but it was during the Roman period that the city’s reputation as a health centre boomed. The hot springs, with its mineral rich waters are said to be good for illnesses such as skin diseases, circulation problems, rheumatism, heart diseases and many other ailments and people flocked here to find relief for their diseases. At the height of this health tourism, there were more than fifteen baths in Hierapolis. If you are visiting Pamukkale and want to enjoy a relaxing swim amongst Roman ruins in the famous Hierapolis hot springs, you should visit the antique pool. The Roman public-bath as one the biggest structures of Hierapolis city serves as Hierapolis Archeology Museum since 1984. In the museum, artifacts discovered during the excavations of Hierapolis as well as artifacts coming from the ancient cities of Laodicea, Colossae, Tripolis and Attuda are exhibited. Archeological relics found in the Beycesultan Mound as the most beautiful examples of Bronze Age make an important part of the museum. Some artifacts found in certain settlements located at Hickory, Pisidia and Lidia regions are also exhibited in the Hierapolis Museum.